Editor’s Note: Updated November 2018. When is voice search finally going to take over? When do we start auto-generating blog posts? Are we still living in the age of influencer marketing? It’s not going to be 2019. But we can elucidate on the B2B marketing trends that are not only underway but will grow more impactful in 2019 and beyond. 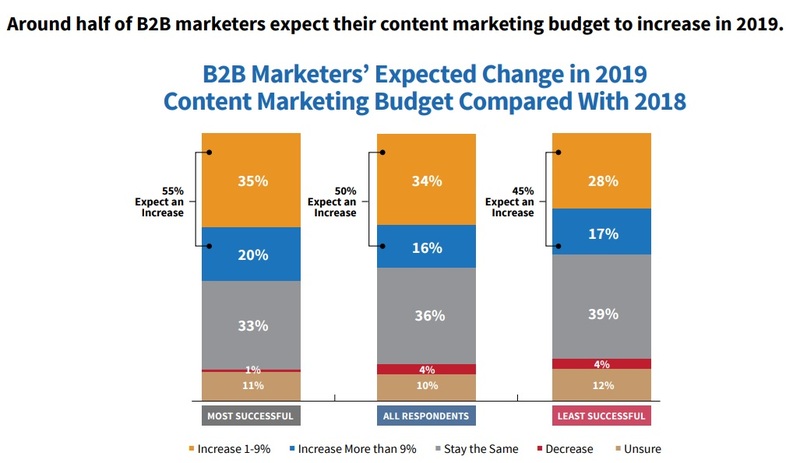 CMI’s latest benchmark report indicates spending on content marketing is expected to rise. 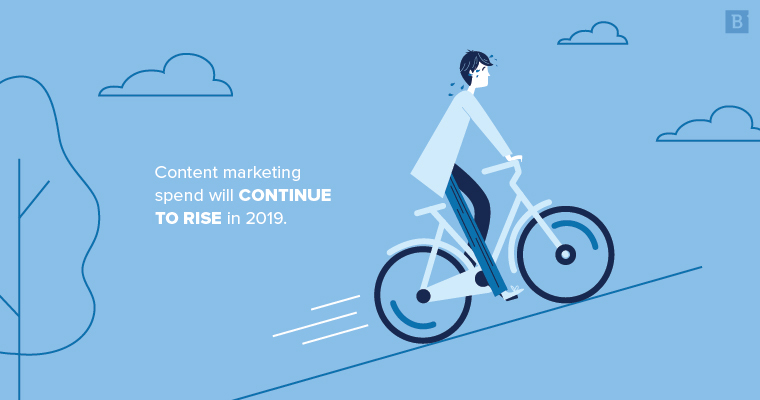 Just 4 percent of B2B marketers will actually decrease their content marketing budget in 2019, while about one-third intend to keep their spending levels static. And how is that money being spent? The majority of new investments are going toward content creation, particularly audio and visual content. And are marketers heading in the right direction? Are they becoming more successful than they were last year? Seventy percent believe so. And 30 percent either don’t believe so or aren’t sure. So what trends are on the horizon? ABM has been a bellwether since 2017 or so. We even wrote an eBook on it. In 2019, more businesses will experiment with account-based marketing because the reported results are just too positive to ignore. Relative to other marketing activities, ABM delivers 97-percent higher ROI. But at the moment, only about 20 percent of B2B brands have dedicated ABM strategies; 60 percent are hoping to implement one soon. 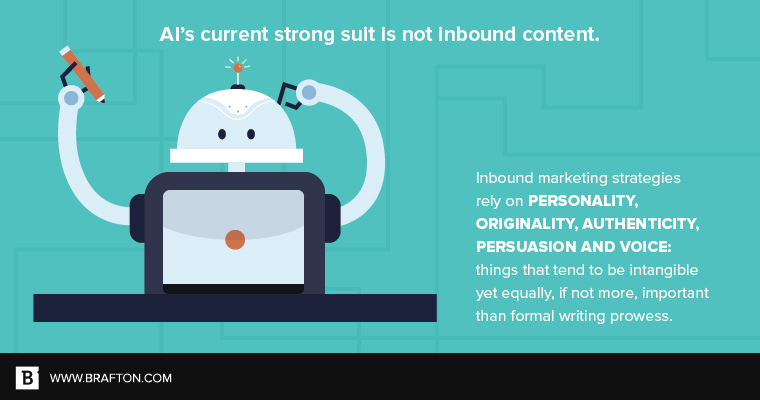 The content marketing supply chain is ripe for automation at nearly every stage. From keyword research and creation to distribution and measurement, the proliferation of marketing automation tools, plugins and platforms has made content more efficient and cost-effective than ever. Actual marketing automation systems are used by 54 percent of B2B brands, although other types of martech have even higher adoption rates. These various technologies are often integrated, so automation is practically inescapable in this era of marketing – and that’s a good thing. 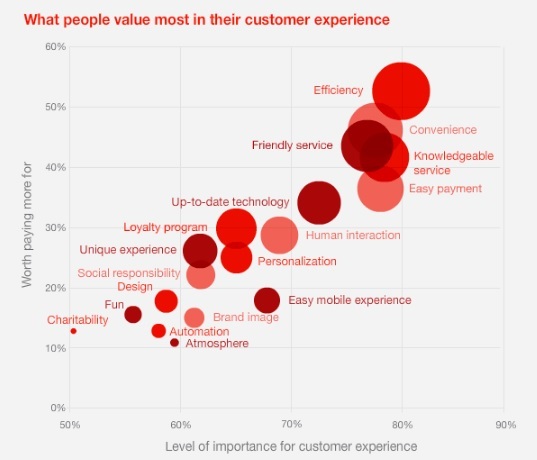 Customer experience (CX) has undergone significant transformation in the last five years. Because the methods of communication and comparison available to consumers pervade our actions and thoughts, businesses are often caught backfooted. Amazon has made same-day delivery an expectation. Netflix has made on-demand streaming a nightly activity. Google has made information of any kind readily available at the tap of a button or the voice command of a user. The “customer” is satisfied only when these networks function exactly and in real time, customs that carry over to the B2B habitat as well. Presently, 46 percent of all B2B researchers and buyers are millennials, so the above customer-experience expectations are innately ingrained into their lifestyles and purchasing habits based on their upbringing in digital-first environments. A large B2B software vendor, for example, must have faster problem-resolution protocols and authentic organic search presences that they may not have needed years ago. 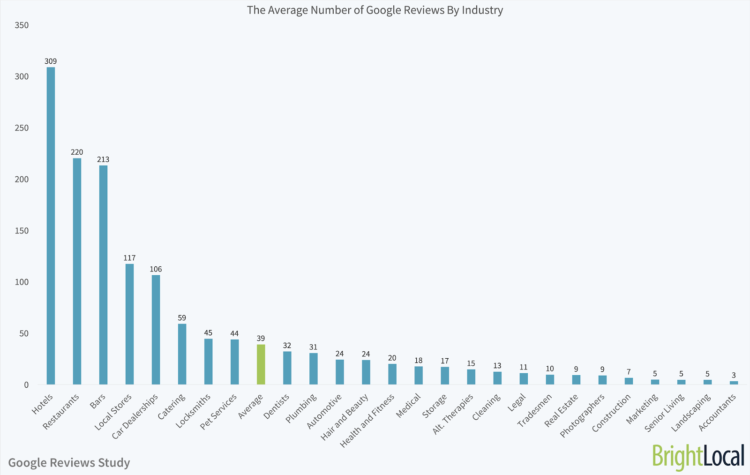 Bad reviews on Google My Business, negative commentary on social media and a lack of positive referrals can lead to irreparable reputational harm and fewer leads. Further, poor UX on mobile sites and apps, incessant cold calls or emails and difficulty locating information online immediately turn off today’s B2B buyer, eroding trust, loyalty and satisfaction. B2C brands have dealt with this reality in front of our eyes, but B2B brands will now confront the same customer-experience challenges moving forward. One of the ways companies are addressing CX needs is through the use of artificial intelligence (AI). 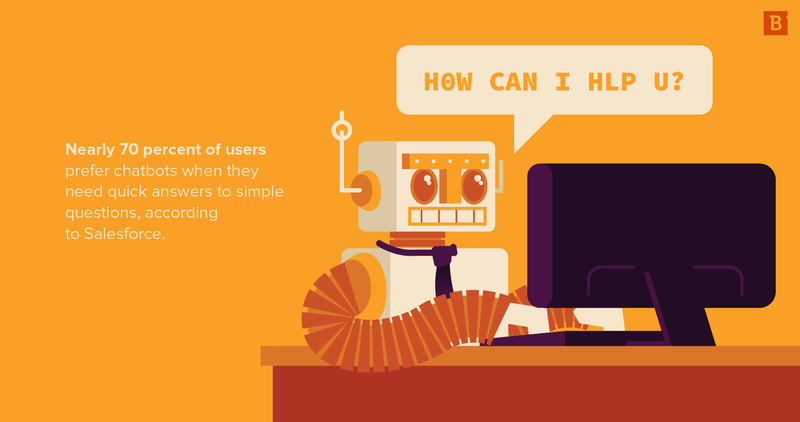 Chatbots have certainly grown in adoption, but they are but one variation of AI for marketers. Programmatic advertising marketplaces are more commonly integrating AI into their ad buying techniques, connecting publishers and advertisers with more efficiency, speed and accuracy – and at a price point that’s already pre-set within the system. AI is still relatively nascent in the content marketing industry from the standpoint of actual production, though. It can help decipher structured data sets and pull out key insights through machine learning, but turning that information into organic content is much more difficult. That’s not stopping marketers from experimenting, however. And rightfully so. They may not be as universally intriguing as Last Podcast on the Left, Serial or NPR’s Hidden Brain, but podcasts about marketing can definitely teach you a thing or two. IdeaCast from Harvard Business Review and Content Champion from Content Marketing Institute have been long-running marketing podcasts of acclaim, and more recently, Searchmetrics launched Voices of Search. We’re also moving with a full head of steam with our podcast Above the Fold. As B2B brands’ marketing matures, more of a focus is placed on actual macro conversions. We know blogs drive traffic, which can be funneled toward gated content, generating leads. But how valuable is a lead that never ever actually makes it toward the bottom of the sales funnel? Content can help at this stage as well. It’s estimated that only 0.75 percent of leads result in closed revenue, which is infinitesimal, especially for companies that already struggle with generating quality leads in the first place. 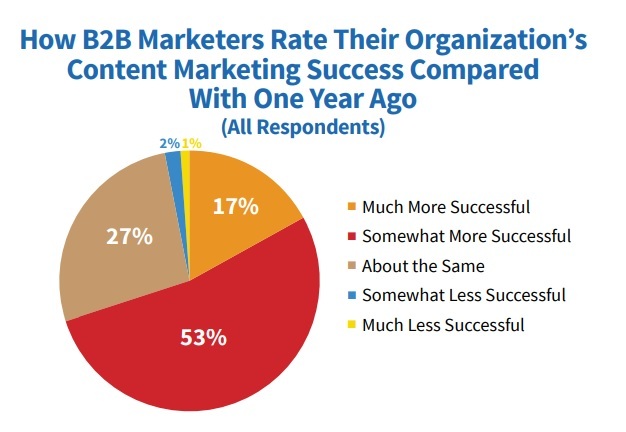 But 41 percent of B2B firms are looking for content marketing to be a veritable “revenue center,” so, clearly, much headway is to be made toward the goal of generating plus converting leads. Using video testimonials, customer references and case studies can help inch prospects toward signing on the dotted line. And that’s what’s necessary for most marketers to justify their budgets to their CEOs – actual revenue, not just micro conversions. More than 50 percent of all B2B social traffic comes from LinkedIn, and 80 percent of leads are derived from LinkedIn, too. 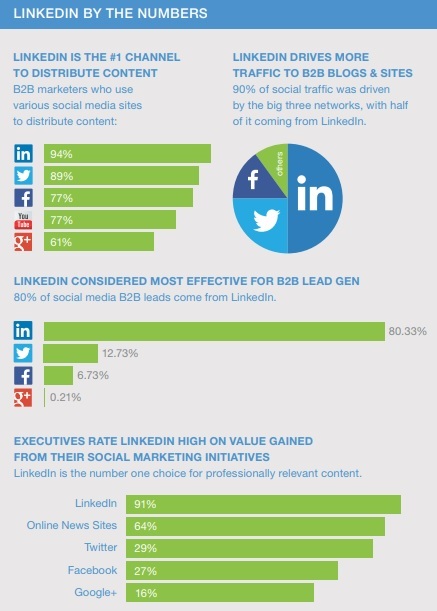 It’s clear that LinkedIn reigns supreme as a distribution channel, a publishing platform and a referral network, so much so that B2B marketers are unsure whether it’s even worth their time to allocate resources toward other feeds like Facebook, Twitter or Medium. B2B buyers, researchers and influencers will likely leverage their LinkedIn profile even further in 2019 and beyond due to the highly valuable concentration of their core target audiences: other B2B buyers, researchers and influencers. One underrated and potentially overlooked component of 2019 SEO is local search. Google My Business listings have traditionally been most useful for consumer-facing brands with geo-targeted marketing and sales strategies. Google Maps and organic results in Google SERPs scrape business data from GMB, allowing searchers to find info about organizations, the products they sell, their physical locations, their contact info and user reviews. B2B brands have been much slower to adopt Google Maps marketing strategies or even to completely populate their GMB listings, not to mention other online business directories like Yelp, BBB, BizJournals and Glassdoor. By forgoing these localized marketing methods, B2B brands may be disrupting the buyer journey of their prospects. If the Knowledge Panel on the right sidebar of Google SERPs displays incorrect information, or it shows that you only have locations in certain regions, searchers may just turn away, believing you’re not equipped to help them in their journey. Organic search is just one side of the marketing coin. B2B brands have found that paid search ads can be a quick and measurable way to immediately leapfrog organic listings in Google SERPs and stand out from competitor posts. For example, the search term “content for SEO” only returns two results above the fold. 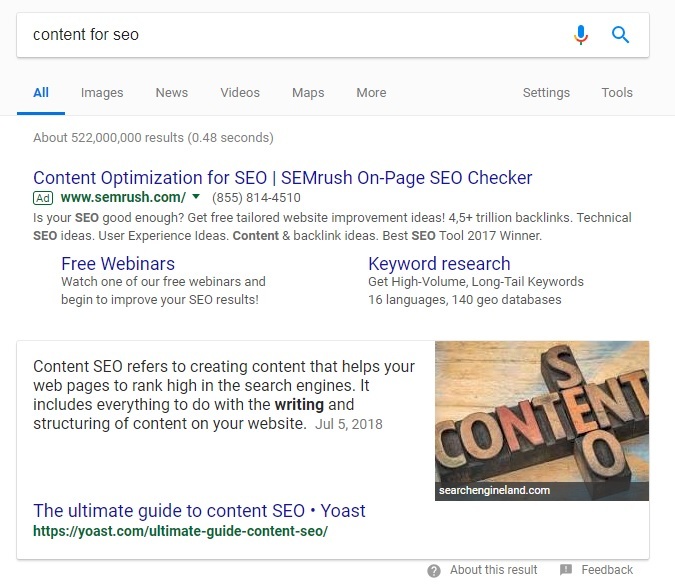 One is a featured snippet from Yoast and the other is an ad from SEMrush. But what about the other 10 or so listing that are also supposed to appear on Page 1? Those positions belong to big industry names like Moz, Wordstream, Search Engine Land and Neil Patel, but you would never know it because THEY DON’T SHOW UP without a user having to scroll down to find them. That’s the benefit of paid ads – immediate SERP ownership over competitors. While all the statistics cite organic content marketing generates three times as many leads as paid ads, that’s not the whole story. For commercial-intent keywords, search ads actually receive twice as many clicks as organic listings. So, the lesson is that informational or navigational content may not be suited for paid ads, but commercial content is. Don’t waste your money paying for advertising campaigns built around wrong-intent keywords. That’s why combining paid and organic strategies is necessary for brand awareness, SERP visibility and high-intent traffic in 2019. There’s too much content on the web. We know that. So flooding SERPs with new content isn’t really the best way to break onto Page 1. Since fresh content requires starting from scratch with external link accrual and waiting for Google to actually index and rank your page, your time-to-rank can be too long to produce the results you’re looking for more immediately. 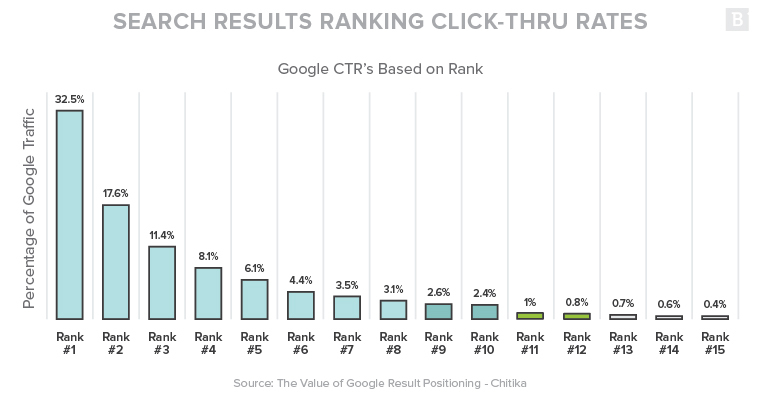 And as the chart above shows, if you’re not ranking in the top three spots in SERPs, you practically don’t exist. Re-optimizing existing posts, on the other hand, allows you to retain your current URL structure and your page’s already-earned link equity and SERP positioning – you’re just making it even better! “Better” could mean updating data with more recent findings, replacing older imagery and expanding upon certain subtopics to improve the comprehensiveness of the page as a whole. We’ve followed this process for over a year now and the results have been just as we expected, including getting 70 percent of our product landing pages ranked on Page 1 of Google. 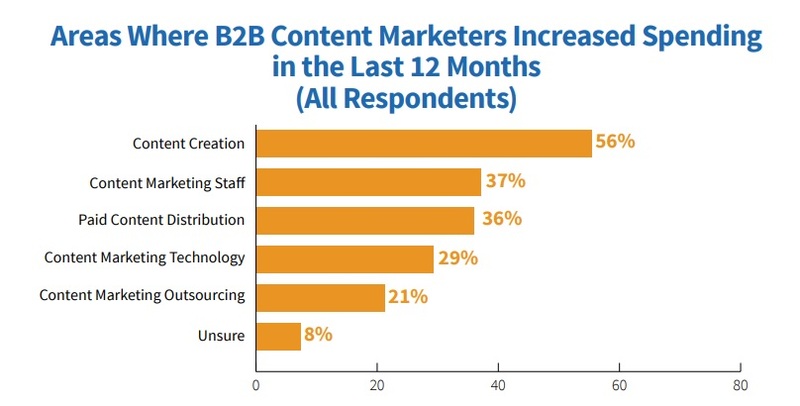 B2B brands are currently ramping up their development of long-form content, specifically. In-depth articles, guides and evergreen lists are ideal formats for continuous optimization over time, as they typically need just minor adjustments to propel higher in SERPs year after year. In addition to LinkedIn, email marketing is a distribution channel that has been rock-solid for B2B marketers. Roughly 60 percent of B2B marketers say email marketing is their most effective channel for generating revenue, and it’s also the third best way to find information. What’s first and second? Recommendations from colleagues and industry thought leaders – hard to beat. 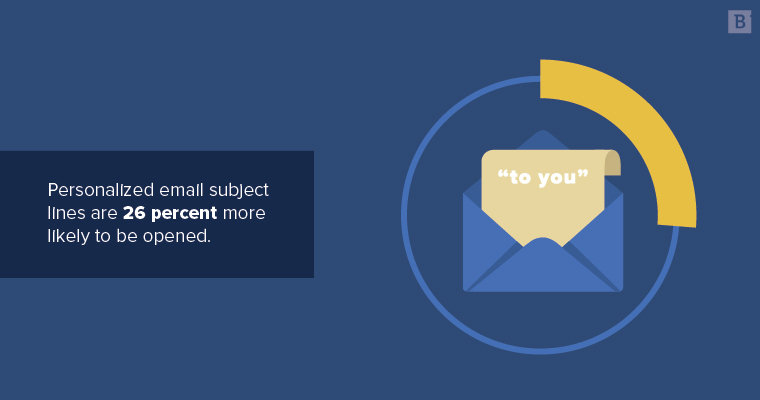 To increase the margins on email even further, personalization has been a goldmine. Because of the number of templates and tools on the market that simplify outreach, personalize messaging and segment audiences, it’s no longer a game of mass email blasts with low response rates; brands can now better measure and predict the success of their email campaigns. Personalized emails have proven to increase transaction rates six-fold, a figure that may rise further in 2019. We promised 11, and we gave you 11! What predictions do you have?